Jack Butala: Jack and Jill here. Jack Butala: Welcome to the Jack Jill Show, entertaining real estate investment talk. I’m Stephen Jack Butala. Jill DeWit: I’m Jill DeWit, broadcasting from sunny southern California. 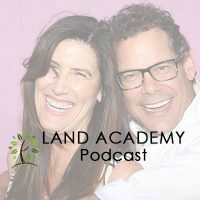 Jack Butala: Today, Jill and I talk about land sales automation. How can you make your life easy? How can you put all the stuff into a system and separate what you really need to do yourself personally and all the other tasks involved to converting land into money in your personal bank account? I feel like I might learn something here. Jill DeWit: How’s that possible? You’re the proof. Jack Butala: That’s why I learn something, because you always have a different take on that sort of thing. Jill DeWit: I’m like, what are you talking about? Jack Butala: Compliment to you. Jill DeWit: You’re the proof. Jack Butala: Before we get into this, though, let’s take a question posted by one of our members on the landinvestors.com online community. It’s free. Jack Butala: Okay. I have so much to say about this. I guess that’s not that unusual. Jack Butala: And Craigslist and Land Pin. Jack Butala: Mobile homes with foundations, you stumbled on a diamond in the rough here. In fact, Jill and I are kicking around the idea after we get House Academy done to do Mobile Academy, and here’s the concept. When a mobile home is grandfathered from a time standpoint, it has a foundation like this probably does, and it’s got an old, ratty, worthless home on it, it’s very easy for you, from a legal standpoint, to bulldoze that off of there and install a new one, or one that’s really recent in age. It doesn’t cost that much money. You can buy mobile homes really inexpensively, probably gonna cost you more to have it installed. Now you’ve got a brand spanking new or a late model mobile home that’s fully functional and that you have, it sounds like, optioned for seven grand, and it’s probably worth a lot. So, chances are, I’m not saying take all this on in your first deal. I’m just saying, if you can duplicate this on two acres, I mean, chances are, if you plop down a 10 or $20,000 mobile home on this spot, you’re gonna be able to sell it for a heck of a lot more. Jack Butala: So, I would love for you to consider something like that. You know how Jill and I always say, “Oh, don’t do anything to the property. Just buy it and resell it and double your money.” You can do that here, or you can really take a look at it and making some serious money on one deal here, with not a lot of work. There’s a lot of people in that business that are looking for this type of property, so I would really consider that. To answer your direct question, where do you post it? I’m gonna sound like Captain Obvious here, but post it everywhere. Jill DeWit: Mm-hmm (affirmative). Exactly. Don’t forget social media. Jack Butala: Where would you post this? Because now it’s a primary residence deal. It’s not a cabin lot. Jill DeWit: I would really zero in on, honestly, it’s two acres. I would zero in on the social media of all the people in that zip code, in that area, because you could do that really easy on Facebook and do some targeted campaigns for people in those areas. Doesn’t matter what they’re into. Just anybody in that zip code needs to see about this. Jack Butala: Jill and I haven’t said it on the show lately, but our absolute favorite types of real estate land property related are mobile home lots. Jack Butala: You don’t have your website up and somebody’s already, you’re gonna double your money here. Jack Butala: There’s reason for that. People love mobile home lots. Here’s really why. Anybody who’s ever lived in a mobile home, and they usually own it, but they’re paying lot rent, their dream is to get rid of that. To put their mobile home, or buy a mobile home, or put a mobile home on their own land and avoid that lot rent. Jack Butala: So, this is a great deal. This is a deal that I … these are the types of deals I actively look at even since I’ve been in the business 25 years. Jack Butala: But I think it’s gonna sell before you even post it. Jill DeWit: It may be sold by now. Jill DeWit: I love it. Jack Butala: A little bit of the lag. Jack Butala: Today’s topic: land sales automation. What is it? Why should you strive for it? And everything in between. This is the meat of the show. When I first heard this land automation, there’s a group on Facebook that we belong to that somebody runs, I don’t remember his name, he’s from Canada, and we contribute to it quite often. When I first heard it, I’m like, what kind of hokey crazy thing is this? Automation? Automation’s for Henry Ford, or for manufacturing airplane parts. It’s not for buying and selling real estate. Well, it turns out I was dead wrong. The more you can mechanize your process and treat every single piece of property with the exact same process, the more successful you’re gonna be. Luke Smith, one of our most successful members, and most vocal members, has this down. This is one of the reasons he is so successful, and quite frankly, one of the reasons that Jill and I are. When we buy a piece of property, we treat it like it’s going down the assembly line. There’s a certain point where we create the posting and sell it, or we check with our A list buyers, and so we have a whole checklist, just like a pilot does. Jack Butala: They run down a checklist before they jump in the airplane, and that’s what we do. So, there’s two types of tasks. You put them in two categories. Ones that you do yourself, you have to do yourself, and there’s ones that you really can sub out or eliminate. In a lot of cases, eliminate the [inaudible 00:06:59]. The person who asked this question, Axle here, used the word leads three or four times in this question, and I believe that word “lead” is antiquated and relatively useless. Jack Butala: If you have a lead, then it means that you’re opening a gate somewhere so that they can contact you to “talk” about selling a piece of real estate or buying it. Jack Butala: What you should really be striving for is just having them check out. Jill DeWit: I want a seller or a buyer, I don’t really want a lead. Jill DeWit: Lead is like, oh, some interest. Jack Butala: Here’s a good example of mechanizing that. So, if you listen to this show at all, you know that we send out tons and tons of offers all over the planet, and the ones that come back signed, we don’t call those leads. We call them done. Jill DeWit: Yeah, they are done. Jack Butala: To use that phrase, and you know what we do about those? Almost nothing. Jill DeWit: We’re gonna get there, man. Jack Butala: Talks at all, it’s Jill and her staff to the seller because they may need one more step. Jack Butala: I think it was yesterday’s show or two shows earlier where I said, Jill brought that last final touch to what I was trying to do a lot of years ago. She brought that human touch to it. But as far as sellers go, we don’t coddle sellers almost ever. Maybe somebody, people in our staff do, but they won’t by the time I get done with them later today. Jack Butala: Yeah, why do we need a stapler? Jack Butala: We talked about it yesterday. Jill DeWit: Using others, the other thing is, too, that you’re really good is using others for menial tasks. Now, and I’ve learned from you and I’ve trained our people, I have people in remote offices, remote locations, who have overseas assistance. I don’t even know what goes on, but I know they’re used the right way. We’ve talked about it, I’ve got them there, it’s like, okay. Why are you sitting here inputting all that data into X? That should be done by one of those people. Bing, got it. It took a little bit. It’s funny how some people have a hard time letting go a little bit. I think that’s it, too. When you’re learning this business and you’re starting out and it’s all you and your one man show, and then you get so busy now your wife or your husband’s helping you, okay, that’s great. Now it’s getting so busy that, uh oh, I gotta bring in more people. I understand it’s a little hard sometimes letting go and trusting, so start with those menial tasks. You’ve got to do it. Because if you don’t, you’re never gonna grow because there’s only so much time in the day and only so much you can do. So, but the menial behind the scene tasks that maybe don’t involve talking to anybody and things like that, posting the properties or, I don’t know, there’s little things … pulling up data, checking, maybe you get all the letters in a little thing like going to the county website and checking the back tax situation, that’s a perfect one that you don’t have to do, that you can hire out early on and someone else can do that. It’d be a huge time saver, and they input it in the spreadsheet, and then it’s there for you, so. Jack Butala: Here’s how I separate tasks that I know that I can send overseas or send to staff. If I can do a short video on it, less than two minutes, on how it, getting property taxes is on bunch of, list of properties, a perfect example. If I can go to XYZ website, record myself in the computer talking, saying, “Go here, go here, go here, type in the APN, and put it in the spreadsheet right here.” If I can record it into a video and send it to somebody, that’s a task you should never do yourself. So, if you just start right there, I bet 80% of the stuff you could do during the whole acquisition sales process, you can break down into little videos and find somebody for three or four or five dollars an hour that can do it for you overseas. Jill DeWit: Mm-hmm (affirmative). Exactly. Jack Butala: Or get your niece to do it or something. Jill DeWit: Exactly. I would recommend, that’s perfect, and that’s what we do. We do make videos, and it’s awesome. Jill DeWit: We even make videos, like we have a staff member’s gonna be on vacation, so she’s making videos for her fill in person so they know what to do. I’m like, it’s brilliant. That’s what should happen. Jill DeWit: Then it’s always there. Should we need to hire, train, or whatever it is, she move her onto something else, it’s always there. Jack Butala: Used to be back in the day it was called policies and procedures. You put a policy and procedure manual together for your job. Jack Butala: No, no one would do it because no one can do my job except me. Jill DeWit: Oh. I love doing it. Pass on my work? Awesome. So I have more free time? Great. Jill DeWit: And the next phase of what you want to do. Jill DeWit: So, it’s just huge. Jack Butala: But that brings a good point. I saw this on Shark Tank recently, and I haven’t stopped thinking about it. Some businesses are meant to be $200,000 or $300,000 a year businesses, and that’s it. That’s where they stop. Jack Butala: Some businesses are meant to be billion dollar or trillion dollar businesses. The business that you’re in or about to get in is a multi-billion dollar business. There are people out there who buy and sell real estate and make a billion dollars. It’s all because they have some type of process that we’re talking about that really works for them, and when one of the links in the chain breaks or bends, they adjust really quickly, or they have people that adjust it. It all starts with one person sitting in front of a computer in a dark room somewhere who hates their job and makes some changes. So, congratulations. You picked the right business. Now you just have to get the processes down and get the right people in place. Jack Butala: I know you would. You’re crazy. Jack Butala: That’s why I adore you. Jill DeWit: I couldn’t stop. Jack Butala: I know. I’m the same way. Jill DeWit: Yeah, that’s true. When I think I peaked, I would be doing another one. I’d still be trying to bring them both up, even. Jill DeWit: Right. There you go. Jack Butala: Then you’re making a ton of money and then what would you say? I know exactly what you’d say. Jill DeWit: I’m gonna go buy the land that it’s on? Jack Butala: Let’s go sell this thing. Jack Butala: It’s not interesting anymore. Jill DeWit: And move on. Jack Butala: And let’s buy another one, or … the thing about real estate, though, is you don’t have to go through that buying, selling, and some of that’s healthy. But there’s just more mail to send out and more deals to do. Jill DeWit: Right. You know the nice thins is real estate is like yogurt. Real estate is like yogurt. Jack Butala: I have a poster coming on. Real estate is like yogurt. Jill DeWit: Here’s why. Because you know what? I can have a yogurt today. I can have a yogurt tomorrow, and I can do it tomorrow and tomorrow and tomorrow. I’m gonna weigh 300 pounds, but it’s not a one time use thing. I don’t need it just once. Jack Butala: A repeat customer. Jill DeWit: Exactly. Same with real estate, because it’s funny. I’m gonna buy a house. I might live in it. I’m gonna sell the house. I’m gonna get another house. I’m gonna live in it. I’m gonna sell it. I’m gonna get another house. It’s not a one time use. So, that’s a beautiful, by the way. Our returns are much higher than a yogurt. Jack Butala: Yeah. I really think that … I often wonder, how much pre-thought does a small business owner really put into, spreadsheet pre-thought? Every time I walk into a restaurant, I walk around and I say, “All right. There’s 42 seats. If there’s two changeovers at breakfast, two changeovers at lunch, and one changeover at dinner, and each plate is, I don’t know, $12 a plate, how much is this restaurant gonna make?” You figure that all out. It’s some number. $5,000, $6,000 a day potential, right? Jack Butala: Then you back off on that because it never happens. Wednesdays are less busy than Friday, so now you’re back down to $4,000 a day, and with the staff and then the rent and the whole thing, there’s no money. Jill DeWit: I would like to add, welcome to my world. Isn’t he a fun date? That’s why we don’t eat out very much. Jack Butala: Oh my God, we eat out every day. Jill DeWit: I’m just kidding. Jill DeWit: I know that. I can see you. Jack Butala: How bad is it? How awful is it, truly? Jill DeWit: Oh, Jack. That’s hwy I often go, “What are you thinking about?” You walk in and you’re like, you’re looking off somewhere. I’m like, oh, no. What’s he looking at? Oh, he sees too much head count right now. He sees there’s too many staff standing out with nothing to do. Jack Butala: That happens all the time. Jill DeWit: I know that. Yeah, that got you. That’s true. Jack Butala: This is a gold mine. Jill DeWit: At the drive through. Jack Butala: The drive throughs the most efficient thing there ever was. Jill DeWit: Yeah. It’s amazing. Jack Butala: I’m shocked that they even let you in the restaurant at all. Jill DeWit: Yeah, they could just make it 100% drive through. I think you’re right. Wouldn’t that be … that’s awesome. Jack Butala: They have four things on the menu. Jack Butala: Really, they’re making about two things. They’re making fries, bread and patties, and then some cheese and stuff. Jill DeWit: It really is. Jack Butala: So, that kind of thing, is that scalable now, or repeatable? I go back and forth in my head. Jill DeWit: I think it’s repeatable. Jack Butala: I don’t think it’s scalable. I agree with you. Jack Butala: I think software’s scalable. There’s no better business than software. Jill DeWit: Right. That’s true. Jack Butala: Or subscription, or publishing. Jack Butala: So, that’s what we’re … automation, to tie this all back in, is what we’re striving for. That type of business where you can just repeat, repeat, repeat, go to Las Vegas, repeat the whole thing, conquer the market. Jack Butala: Go to Miami. That’s what we do. Jack Butala: Without really spending any real acquisition capital or any additional fixed costs, it truly is, the way it’s structured, real estate is truly a fantastica opportunity, not to mention the income statement and balance sheet benefits. It’s very rare to get both. Jack Butala: Wow. Jill’s very patient. Join us tomorrow for another interesting episode of the land investors’ show. Jill DeWit: And we answer your questions, should you have one. Post it on jackjill.com. Go there. It’s free. Jack Butala: You are not alone in your real estate ambitions. All right. I just realized I kind of ranted and went on. Jill DeWit: You kind of did. Jack Butala: How bad was it? Jill DeWit: No, it was good. It was healthy, and I’m glad. Do you feel better? Jack Butala: No, I just … I just have this insatiable need to, I don’t know, grow. I know you do, too. Jill DeWit: Think bigger, man. Jack Butala: Yeah. Think big. Jill DeWit: You know? There’s nothing that you can’t do. You could make this huge. Jack Butala: I had dinner with, Jill and I had dinner, this is about a year ago, with a buddy of ours. His friend, they’re both retired, and this guy’s buddy, who he’s from somewhere in Scandinavia. He bought his son, as a graduation gift, a tiny little condo. This guy parlayed that one real estate deal into a billion dollars in equity in about 22 years. He traded up and traded up and traded up. Jill DeWit: I don’t even know who that is. Jack Butala: It’s up in … we had lunch with them, actually. It wasn’t dinner. Their kids went to Palos Verde. Jack Butala: He’s got a big manufacturing facility. Part of it’s closed, and they use it as a movie, a horror film movie studio. Jill DeWit: Yeah, he made a part of it a hospital wing and they do a lot of hospital shows. I know what you’re talking about. So, yeah. Jill DeWit: Oh yeah, that’s true. See? There you go. Jack Butala: Is it scalable, technically? I’m not sure, but man, it’s pretty close. Jill DeWit: Yeah. That’s awesome. Hey. If you think that’s awesome, share the fun by subscribing on iTunes or wherever you’re listening. While you’re at it, please rate us there. We are Jack and Jill.